When Maya (Nadine Lustre) was a kid, her grandmother would always tell her stories about the tikbalang and other forms of superstitions related to rain. Back then, Maya already had a wild imagination. Fast forward to 10-plus years later and everyone keeps bugging grown-up Maya about having a boyfriend—her aunt and uncle, even her boss. But it seems she's always getting hurt, and her gay best friend Topi (Josef Elizalde) is a witness to this. After one particular heartbreak, she vows that she will NEVER cry about "love" again. The dreams and fantasies we had as kids don't always come true, and you know what? That's okay! Nadine's latest film is Never Not Love You (2018), where she starred opposite her boyfriend James Reid. Recently, the couple also collaborated on a track called "Summer." Carlo Aquino starred in his reunion film Exes Baggage with Angelica Panganiban in 2018. He was also part of the daytime TV series Playhouse with Angelica and Zanjoe Marudo. Marco Gumabao currently stars in the ABS-CBN teleserye Los Bastardos as Matteo Silverio/Matteo Cardinal and is set to star in a film called Just A Stranger with Anne Curtis. AJ Muhlach was a member of the boy band XLR8 and he starred in the TV serials P.S. I Love You and Bagets. Child actress Elia Ilano has taken part in the TV serials Sana Dalawa Ang Puso, La Luna Sangre, and Ang Probinsyano! Director Irene Villamor started writing the script as early as 2005. In an Instagram post from June 2018, the director shared, "Kada umuulan, nagre-revise ako nitong script na nagsimula sa isang maikling kwento [na] sinulat ko maraming taon na ang nakaraan. Ngayo'y naninilaw na ang mga pahina. Pero buo pa rin ang mga pangarap ko habang bagyo, paglalakad nang mag-isa habang bumabaliktad ang payong at tinatangay ng hangin ang dating manipis kong katawan...at isang beses na minsan sumilip ang araw habang ambon. Ngayon, muli kitang binabalikan. Dahil ikaw ang una kong pag-ibig. Ang unang sipon at lagnat." During their early days of filming, people thought Nadine and Carlo would be playing college students. Some fans even recreated one of their behind-the-scenes photos! When the trailer was first released, people speculated that Ulan might be a horror movie because of mythical creatures such as tikbalang featured in the teaser, but Nadine cleared those theories and said that the film is a love story. Xian Lim was originally supposed to play the role of Peter, as announced during Ulan's press conference in August 2018. 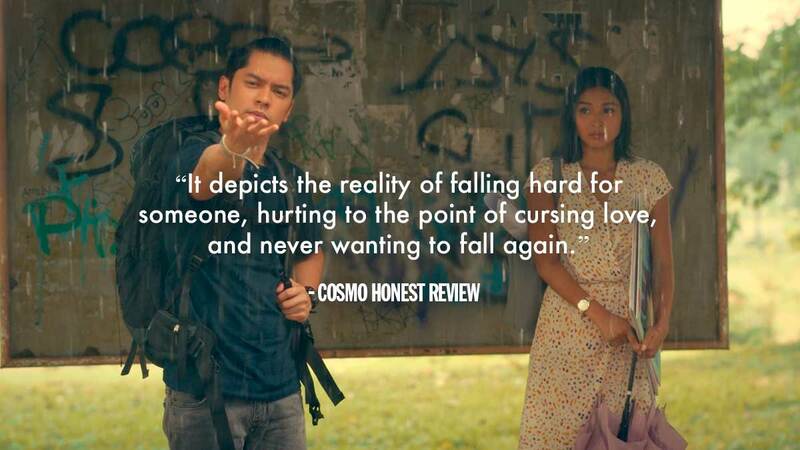 In October 2018, Carlo Aquino took over the role and officially joined the cast. The voices of the tikbalang in the film are from actors Dingdong Dantes and Mercedes Cabral. It's really hard to write a spoiler-free review for this one (but I'll try)! Ever since Nadine's first solo film was announced, I was intrigued. It was weird that they didn't reveal details about the plot and all we knew about it for the longest time was that it was a film about "self-love." After watching Ulan, I realized why they were so vague. I personally like it when it rains, and the fact that Maya had such a deep connection to it in the film was awesome. We've all got personal stories, memories, and superstitions regarding ulan and I love that the film centered on that! I adored Young Maya's innocence. She reminded me of myself as a kid—Maya was hopeful, carefree, and she had such a deep crush on one particular boy who gave her a lot of attention (like me, when I was eight years old). This is my favorite movie starring Nadine Lustre, so far. She was honestly gorgeous as Maya and her acting, for the most part, was sooo natural! And like everyone keeps saying on Twitter, the cinematography is first-rate! While watching the film, I wanted to ~enter~ the screen and live in the warm tones and aesthetically-pleasing shots, costumes, and production design of Ulan. I had a small problem with the ending, I wish it ended differently. I also understand how the film might not be everyone's piece of cake, but I personally liked it and I think Ulan is really worth watching! "I love how Ulan depicts the reality of falling hard for someone, hurting to the point of cursing love, and never wanting to fall again...all but to find yourself trapped in the cycle once more when you meet someone new. Nevertheless, it manages to teach a very important lesson in the end. People (girls, especially) who grew up believing that finding a partner in life will "complete" them. Those who miss their childhood and the magic that came with it.